What a gorgeous painting. My friends brought this back for me a few weeks ago. 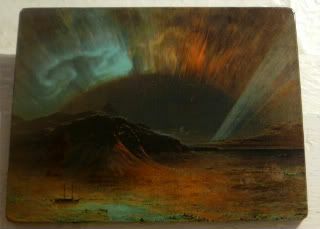 Do you suppose, back in 1860, when Fredric Edwin Church painted his Aurora Borealis, that he ever thought that man would be Tweeting the same image...from space? While I get it's totally a PR mechanism for NASA, I can't even believe that all the astronauts are allowed to Tweet...much less from space. And holding Tweet Ups? Wha? Anyway, from this Church painting to those Twitpics, it's truly unbelievable how far we've come in the last couple of centuries. Back then, it was amazing that Dr. Isaac Hayes was leading an expedition to the Arctic, and that he made it back alive. He's the one who brought back sketches from his trip, and gave them to Church to paint. Folks actually considered this painting a portent of doom, an omen for the ensuing conflict between North and South. Now, we're marveling over Twitpics from space. Whew.